Do you know which version you watched as there are 3 versions on the disc, The Original Theatrical Cut, The Special Edition and The Director's Cut? The Special Edition had some scenes removed and some other minor tweaks as well as 2 major sequences added. The Director's Cut added back some of the removed scenes and removed one of the added in major sequences. I thought the Director's cut was the probably the best version when I rewatched them recently although I have a soft spot for the original theatrical cut as that was the one I saw at the cinema . I watched the original cut. 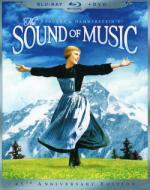 This is a film I went into not expecting to like at all as I am not a big fan of musicals. But found I enjoyed the story quite a bit. Though I do feel lit went on a little too long. In my opinion it should have ended with Marie coming back to the family and her and Captain Van Trapp getting married. The extra Nazi stuff in my opinion was too much and not needed at all. But over all I am still surprisingly glad I watched it. It is a dark time for the Rebellion. After a devastating attack on their ice base on the frozen planet of Hoth, the Rebels are scattered by Imperial pursuit. Luke Skywalker seeks out the mysterious Jedi Master Yoda in the swamps of Dagobah, while Han Solo and Princess Leia outrun the Imperial fleet to the beautiful Cloud City of Bespin. In an attempt to convert Luke to the dark side, the evil Darth Vader lures young Skywalker into a trap. In the midst of a fierce lightsaber duel with the Sith Lord, Luke faces a terrible truth about the Skywalker legacy. So of course I had to watch at least one of the films today. Watching these in production order this time. So next time I will watched them as the studios numbered them. This is a good continuation to the previous film. And it still holds up rather well after all these years. It really is hard to believe this film it almost 40 years old. It remains well worth the time put in to watch it. 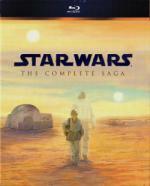 And I ook forward to contue watching the saga through--out this year long challenge. 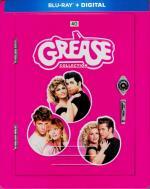 The classic tale of good girl Sandy (Olivia Newton-John) and bad boy Danny (John Travolta) gets tuned up with some new special features in this Grease 40th Anniversary Edition. Your favorite movie musical just gets better with time. It's peachy keen, jellybean! Directed by Academy Award® winnerº Steven Spielberg, Jaws set the standard for edge-of-your-seat suspense, quickly becoming a cultural phenomenon and forever changing the movie industry. 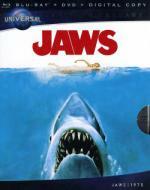 When the seaside community of Amity finds itself under attack by a dangerous great white shark, the town's chief of police (Roy Scheider), a young marine biologist (Richard Dreyfuss) and a grizzled shark hunter (Robert Shaw) embark on a desperate quest to destroy the beast before it strikes again. Featuring an unforgettable score that evokes pure terror, Jaws remains one of the most influential and gripping adventures in motion picture history. º1993 Best Director, Best Picture, Schindler's List; 1998 Best Director, Saving Private Ryan. This is another film I haven't seen in years. It held up well. It is a very good story but I do find it a little on the slow side at times. Richard Dryfuss is the big name I recognize in this film... I was never much of a fan of Richard Dreyfuss though I did enjoy him in this more then I do in most movies I have seen with him. I must say that the mayor and his people is enough to agrivate someone. Worrying more about how much mone is coming into town more then people's safty. This film deserves the reputation it has recieved. A well made enjoyable film. Definitely one I would have no problem recommending. I found this one to be a really fun film. Sure there is a lot of unrealistic stuff here, but that is easily forgiven. I thought the entire cast did well and I liked seeing all the different types of animals. This film has plenty to laugh at and I found it top be just a feel good film. I had to watch my roommate's copy but I do definitely hope to add this one to my own collection before too long.